Check our website or Facebook page for our newsletter! We provide a high quality and affordable juice to optimize health, wellness, and quality of life. We pride ourselves on the juice we press daily for its freshness, taste, and its nourishing and vitalizing quality. We follow "green business" guidelines which include reusing our containers, using organic produce grown on local, sustainable farms, deliver in hybrid automobiles, and being genuinely mindful of our impact on the planet and its beings. We Believe The Best Cure is Prevention "but"
deeply hydrating organic water containing the essential nutrients and the energetic imprint and vibrational essence of the plant and its environment. Raw vegetables in juice form are the very finest nourishment we can get. Juice requires minimal digestion. We quickly and easily assimilate live juice. Nutrients are in ion form (suspended in juice water) becoming absorbed directly into the blood stream soon after drinking, and the remainder within a few minutes. Pain; Reduction and elimination of inflammation-that which causes pain. New orders or change to an existing order must be made 24 hours in advance. Email us at juice@ahjuice.com or call 805-698-5443. Your request will be confirmed by e-mail or telephone. Juices are available 5 days a week by 6 am (kitchen only). Other locations by 7:30, or 8, or 8:30 am, M-F, depending on location. Please visit our website for more detail on flavors and locations. Free Delivery in core downtown with a minimum order-contact us for details. Delivery to other locations within certain areas is available for prepaid minimum monthly orders and delivery fee. To start choose what you want including flavor and size, the day you want it, and which area (Santa Barbara, Goleta, or Montecito) you want to get your juice, and give us your credit card information. We press four different juices daily, red, sweet red, green and super green. Each contains the same base of about 13-15 locally grown, organic vegetables. We add red, purple, and/or golden beets and their tops to the reds, one is sweeter. Super green has no carrot or apple, simply the luscious green veggies. We suggest you taste both to see if you prefer the red or the green juice. Both are very nutritious, tasty, and have the same base of vegetables (see below). Once you place an order we'll send you details of how to access your juice based on the location where you want to pick up. All juice is preordered. Emailing us is our preferred method for receiving, canceling, or postponing your order. Please do so at least 24 hours in advance. Unless you hear from us within 12 hours (usually much sooner) to confirm your request, assume we have not gotten it and repeat your email. For 30 day prepayment (not based on calendar month) you can get the total. You do not have to use all the juices continuously, postponing it for some days and resuming will not result in you losing those juices. You are allowed 4 months to use up all the days. Juice must be pre-ordered 24 hours in advance and you pay as you receive or you can prepay. We require your credit card information as security with your first order. Please call the juicery number to give the info over the phone: 805-698-5443 or call Alfred at 698-1162. Payment can still be made in cash, check, or by credit card. Juice is available 5 days a week by 8, 8:30, 9 am M-F depending on where you get it from. Listed below are the locations where it is delivered. We are guests at each individual site-all transactions (ordering, payment, etc.) are made with us directly. Please contact us for specific details of each site. The first site looks at enzyme count and retention, juice quantity, and a comparison between juicing organic and conventional carrots. The other site looks at mineral content and juicing amounts extracted from the Norwalk in comparison to a centrifugal type juicer and the champion when using 4 different vegetables. According to the Bailey report the Norwalk extracts much more efficiently, in some cases more than 400% more minerals, then either of the two (magnesium and phosphorus). 2. Eighty to ninety percent of our juice is extracted from high quality organic vegetables from local farmers and used within one to three days after harvest. The produce is teeming with vitality, and the soil within which they have grown is vibrant and organic. The freshness maximizes not only the vitality, but also the transmission of Qi (energetics) from the plants into the juice. 3. Our juice is 100% raw, unpasteurized, and never processed. This provides the highest assimilable and usable nutrients, and highest quality "organic" water, providing deep hydration (molecularly designed by plants to move in and out of the cellular membrane). 4. The main focus of our business is to provide health and wellness. We do this by producing the highest quality products and services that will provide the most benefits (health & medical) to individuals at an affordable price. Juice fasting greatly accelerates the healing processes. By flooding your system with nutrients (juice) while giving your digestive system a rest allows your body's energy to focus on healing. Fasting addresses the entire body from the most recent and superficial imbalance and disease to the deeper and older conditions. It is the fastest natural way to turn things around. 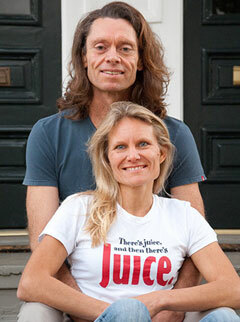 Integrating regular Juice fasting in your life serves to cleanse, rest, and rebuild organs and tissues. This is extremely beneficial for the maintenance of health and wellness. If you want to create a breakthrough in your health or to accelerate a healing or detoxifying process you can integrate a fast for one to several days. Contact us for details or consult with Alfred. Health consultations with Alfred are available. Using both an Oriental Medicine and Modern Nutrition approach we will examine and evaluate for specific or general health and/or medical concerns. After the evaluation, appropriate recommendations are given. Contact Alfred at 805-698-1162 or email at juice@ahjuice.com. I have always appreciated food, not only for its tasty delicacies but also for its nutritional value. Even as a child I knew the importance of eating vegetables and included them regularly in my diet. As an adult I continuously studied the western approach to nutrition and later, as a student and practitioner of Oriental Medicine, the eastern perspective. Most great healers have held that food is our greatest medicine and to understand and use it accordingly is our pathway to good health and wellness. Just as unhealthy eating can result in sickness, having a wise and knowledgeable relationship to food will lead one to a long, healthy, and active life. I have been a vegetarian for fifteen years, and I really enjoy the feeling of being active and putting healthy things in my body. As a vegetarian, I’m especially aware of the need to make sure I am getting the right balance of nutrients. Supplying enough iron and some key vitamins and minerals has sometimes been a challenge for me, and as I burn a lot of energy, when these elements are deficient, I tend to feel anemic and depleted. Drinking live juice every day has made this problem disappear. The juice makes my body feel wonderfully supported and nourished. It is such a pleasure to be a part of sharing this experience and making this incredible, vital nutrition available to others. I have always believed that we hold the power to heal our bodies and live healthy, strong lives. For me, drinking live, fresh juice everyday is an important part of that commitment.